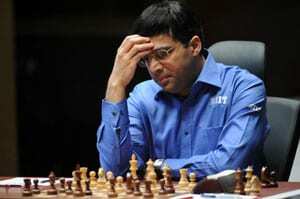 Five-time world champion Viswanathan Anand on Saturday, gave jitters to his fans before signing an early draw with top seed Levon Aronian of Armenia in the eighth round of Candidates chess tournament here. Mamedyarov played the Sicilian defense and the game took shape in a variation akin to the Dragon variation. Topalov did not get much and Mamedyarov came up with a piece sacrifice to complicate matters. Not wanting to take any undue risk, Topalov returned the material in time to reach a drawn endgame. The game lasted 32 moves.